After we went to Mitake last time, I happened to tell the English Club about our adventure. The ladies asked me whether we tried the famous sake from Sawai. ‘No! I didn’t know about it! We must go back and try the famous sake,’ I declared. So we went back to the valley today. When researching the area previously I came across a great blog site, ‘Studies of Plants and Wildlife’, written by Kazuya Numazawa. The man is a connoisseur of pleasure and ‘a man after my own heart’ (as Redmond would say). I have read many blogs since my time in Tokyo and his just hit the perfect note for me. It is a pity that Numazawa is no longer keeping his blog. Our trip, in some way, paid homage to his adventure in seeking pleasure in nature and food. As before, we walked from Ikusabata to Sawai. This time though we followed Numazawa’s iternary and stopped in Sawai and tasted the famous local sake brewed there. We also had the tofu he recommended (plus a few more dishes). The food was great and the view was just beautiful. We then walked to Mitake along the other side of the river passing a temple and many little natural shrines – it was a natural historian’s delight. 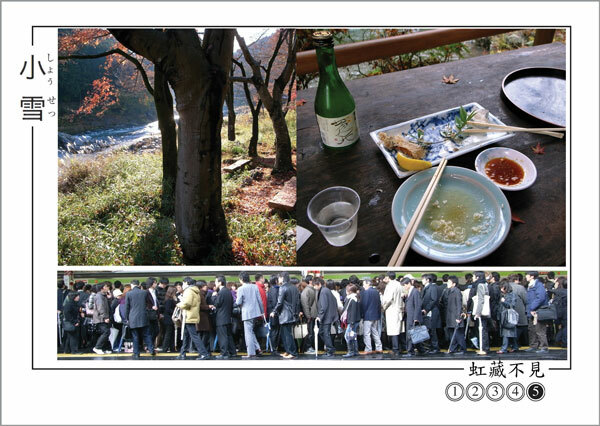 When we receached Mitake we also followed Numazawa’s example and had a second lunch. This was at a Soba restaurant which had the most amazing traditional thatched roof and from the second storey we watched the sun slowly set behind the mountain range. We were so full after having a soba meal each and some salt-grilled river fish that Numazawa’s ramen shop and the onsen in Oku-tama will have wait for our next visit.